The Swingline™ CX40-59 cross cut shredder is Swingline™ shredder's top commercial shredder, fulfilling the needs of busy workplaces. 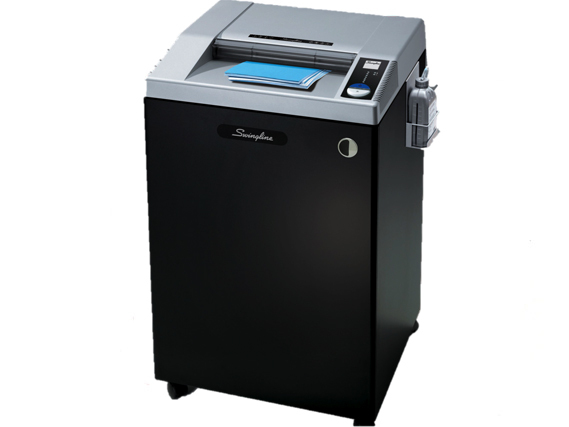 The Swingline™ shredder is classified as TAA compliant; approved for government purchasing. The cross cut shredder shreds optical media, paper, credit cards, staples, and paper clips. The Swingline™ CX40-59 cross cut shredder's wide feed opening enables shredding of large document sizes. The Swingline™ shredder clears paper jams using the advanced Jam Stopper® technology; automatically reversing the jammed paper. The Jam Stopper® shredder is a chain driven gear Swingline™ shredder model; ensuring large jobs are shredded smoothly. The Jam Stopper® shredder automatically oils the cutting blades so that they last longer. The Swingline™ CX40-59 cross cut shredder's thermal overload protection ensures the motor doesn't get hot. The Swingline™ shredder is capable of shredding continuously; saving time. The Jam Stopper® shredder features a wire-frame waste bin with a bag full indicator that indicates when the Swingline™ shredder's bin is full.